Arthroplasty, a method of ankle replacement surgery, is grounds for celebration in the orthopaedic community. The surgery involves making a small incision on the front of the ankle, removing the damaged bone and cartilage joint, and inserting a prosthesis made of metal and plastic. State-of-the-art instrumentation used in so-called “second generation” ankle replacement procedures allows surgeons to make more precise cuts, which Dr. Rush says means “tighter, anatomically fitting implants” that are “less likely to be loosened or misaligned.” Correct alignment is essential for long-term success in arthritis pain relief and mobility. What Is Ankle Replacement Recovery Like? For the first two to six weeks, patients will need to use crutches, a walker or a wheelchair to get around and avoid bearing any weight on the ankle. By eight or ten weeks, patients are usually able to wear a regular shoe again. The metal components of the new ankle hold up very well, but the plastic spacer may wear out after five to ten years, requiring a minimally-invasive replacement procedure that involves a two-week recovery period. Ankle prosthesis includes a metal and a plastic component. What Complications Exist For Ankle Replacements? Though rare, possible issues include: nerve impingement, bone fracture, infection, and joint loosening. Complications are possible with any surgical procedure, but board-certified surgeons specializing in reconstructive ankle surgery can manage these situations with ease. Why Is Ankle Replacement Better Than Ankle Fusion? Ankle replacement gives patients vastly improved mobility. They are able to walk, hike, and bike with the family, without pain and without needing drugs to manage inflammation. Patients can even play doubles tennis and cross country ski, but they are still advised to take it easy with jumping, running and contact sports. “Joint fusion can treat pain and arthritis as well,” explains Dr. Nadia Levy with The Center for Podiatric Care and Sports Medicine. “However, it often leaves patients stiff-legged with very limited mobility. Furthermore, the adjacent joints become more prone to developing arthritis.” By contrast, patients with new ankles enjoy reduced stress placed on the front ankle, which allows them to walk with a normal gait and perform more of their favorite activities. 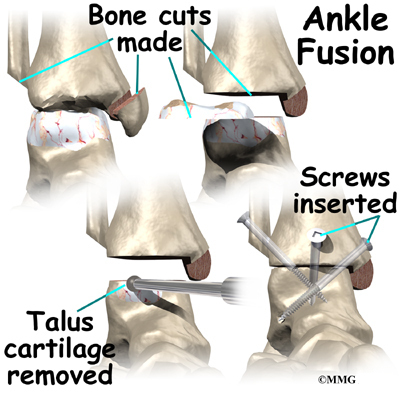 Ankle fusion procedures result in more limited mobility compared to ankle arthroplasty. Who Gets Ankle Replacement Surgery? Ankle arthroplasty is popular for people in their forties, fifties, and sixties. Many patients had previously received a fusion or first generation ankle replacement done years ago, and wish to have better mobility and pain relief. Surgeons say that patients should not consider ankle replacement if they have: peripheral arterial disease, neuropathy, poor circulation, or a significant deformity. Considering Ankle Surgery In New York? The Center for Podiatric Care and Sports Medicine in New York City offers a number of highly-skilled, board-certified surgeons who specialize in reconstructive ankle surgery. Contact us to inquire about the procedure today.